“Pad Treatment” is the same formula as Dampp-Chaser “Humidifier Treatment.” New name, same product. Sold in a 16 oz bottle which lasts about two years. WARNING: Add only Dampp-Chaser PAD Treatment to the Humidifier water. Other brands of water treatment contain acids which corrode strings and metal parts in the piano. The use of other water treatments will void the warranty of the Piano Life Saver System and may void the warranty of the piano manufacturer. Specifically formulated for the Dampp-Chaser Humidifier, PAD Treatment prolongs Humidifier Pad life, keeps the watering tube clean and clear, and reduces mineral build-up in the Humidifier tank. DIRECTIONS: When adding water to the Humidifier, add 1 capful of Treatment to each can. 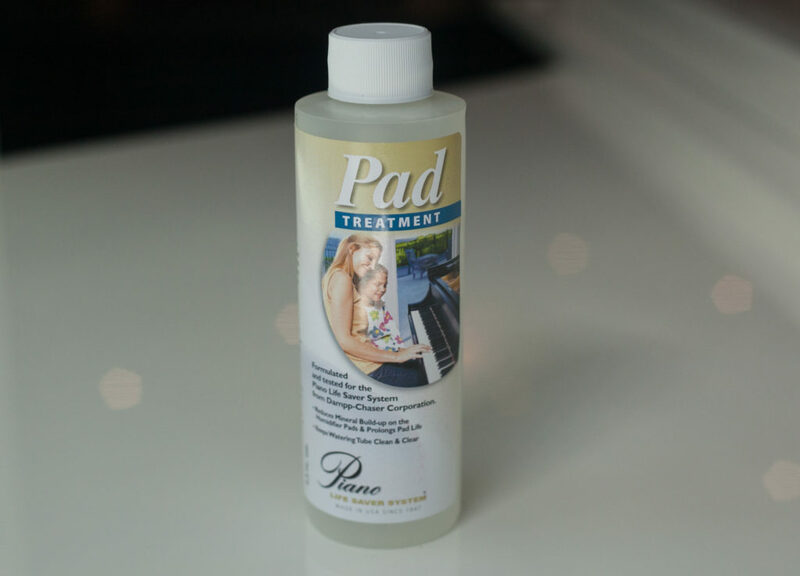 PAD Treatment is the only product recommended for use in the Piano Life Saver System Humidifier. Other brands of water treatment contain acids that can corrode strings and metal parts in the piano. USE OF ANY OTHER PRODUCT WILL VOID THE PIANO LIFE SAVER SYSTEM’S WARRANTY.